May 15, 2017 – This week, for our 100th interview, our time machine visits some of the most heated fighting — political and on the battlefield — during the American Civil War. We’ll experience the great conflagration through the eyes of a soldier and his young love, whose father just happens to be a Democratic state senator, who begins to doubt Lincoln’s war effort as it drags on year after year. Letters aren’t rare from the American Civil War. But what is rare — very rare — is to have both sides of a correspondence preserved. Into this historical void steps today’s guest, Gene Barr, who benefited from the chance discovery of love letters from young Jennie Lindsay and her soldier in Union blue, Irish immigrant Josiah Moore. This treasure-trove also included pictures, and gives us a full picture of a romance that adds tremendously to the historical record. 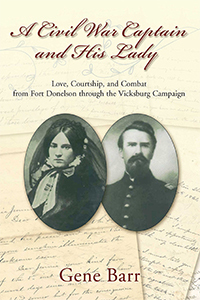 Gene Barr’s book is, A Civil War Captain and His Lady: Love, Courtship, and Combat From Fort Donelson through the Vicksburg Campaign . You can find him on Twitter @GeneBarr_55, or at Facebook.com/JosiahAndJennie.